Bambi initially came out in theaters of North America on August 20th of 1942. However, because of the Second World War, it’s release was delayed for more than 5 years in Europe and only came out in 1947. The movie had to directly succeed to Snow White, but was postponed due to diverse budgetary setbacks as well as for artistic qualifications – Walt wishing to obtain a highly more realistic look than the previous productions. Thus, the producers and animators had a lot ahead to do! The circumstances have permitted the releases of other movies before Bambi: Dumbo, Pinocchio and Fantasia. 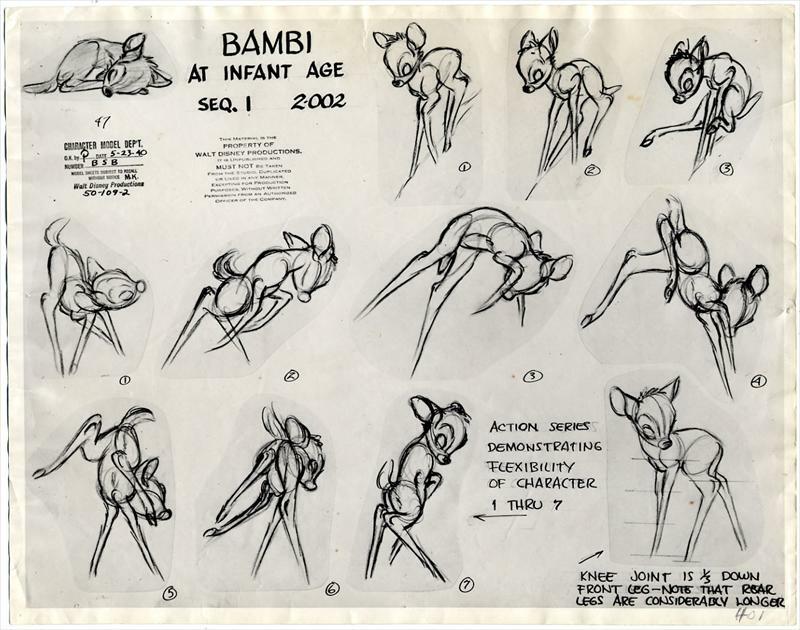 Nevertheless, Bambi had more success than these animated features and is since, one of the most acclaimed classics productions of the history of traditional animation and considered as being the favorite of Walt Disney himself. Bambi: A life in the woods, was initially only available in it’s written language. The novel was later on translated in English in 1928. The animated movie realized by Disney largely differs from it’s source of inspiration (considered too rough to suit the targeted public), but it did not prevent the foil of the story’s main themes: love, mourning and membership. Five years were necessary to create Bambi, a movie during 75 minutes. 250 persons collaborated, among 50 draftsman and 37 animators. When we are viewing the movie, 100 800 drawings scroll under our eyes. 450 000 Celluloids or Cellos (transparent supports on which are drawn the drawings) were held for animation: More than 4 millions were created! Less than 900 words are pronounced, while the book holds approximately 10 000. One of the most terrifying sequences of the movie is certainly the forest fire. The violence of flames, the noise of wood that burns seems more true than ever. Bambi must learn to dominate the pain of his wounds, caused by a hunter. To make a success of such scenes, Walt Disney appealed to the person in charge of the special effects, Jim Mac Donald – who was the second voice for Mickey, after Walt. To reproduce the noise which destroys the tree trunks and foliages, Jim used wooden crates. To recreate the thunder, he shook chains on a big sheet of steel. To imitate the shiver of a spider web, a tiny and little usual sound, after many researches, Jim slowly shook sheets of duralumin, a hard and light metal compound of aluminum and copper. When Walt Disney dashed into the making process of Bambi, an official organism of the region’s waters and forests offered him two fawns to serve as models for the story’s heroes: Bambi and Faline. They grew during the making of the movie. All the studio’s artists and animators observed and tamed them in order to be able to draw them with perfection. This entry was posted in animation, disney and tagged animation, disney, documentary on October 7, 2015 by mattkprovideo.